Prime Minister Hun Sen and Laotian Prime Minister Thongloun Sisoulith announced their decision to write to France last Friday following a two-hour meeting at Phnom Penh’s Peace Palace. The two premiers said they would ask French President Emmanuel Macron for more detailed maps, historical documents and other experts to help resolve the dispute. Var Kimhong, the minister in charge of border affairs, said yesterday that Cambodia’s Foreign Affairs Minister Prak Sokhonn and Laos’s Foreign Affairs Minister Saleumxay Kommasith will meet on Tuesday and Wednesday to draft the letter. Kimhong declined to provide further details. Tensions over the border between Cambodia and Laos have been simmering for more than a year. The dispute flared last month after about 30 Laotian soldiers crossed the Sekong River and stationed themselves a few kilometres from the Trapaing Kriel International Checkpoint in Stung Treng province. 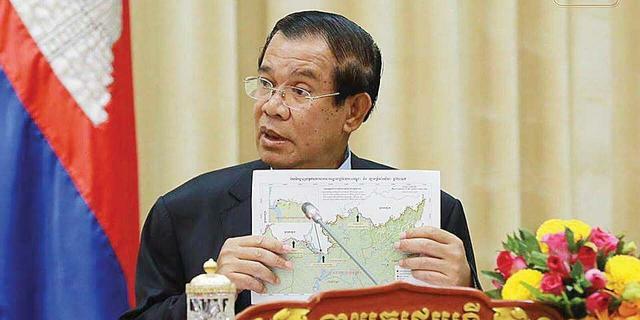 The force withdrew after Hun Sen ordered more troops to the area and flew to Vientiane to meet with Sisoulith. At Friday’s press conference, Sisoulith said the solution would be based “on friendship and equality”, and that neither country “will get an advantage over the other”. “We will solve the remaining 13 percent or 14 percent of the border issue successfully and leave it as a legacy for our future generations,” he said. Last year, Cambodia and Vietnam also announced plans to ask the French government for help preparing maps to resolve tensions over their long-disputed shared border. It is unclear how near the two sides are to completing the demarcation. Ministry of Foreign Affairs spokesman Chum Sounry and French Embassy spokeswoman Mathilde Teruya did not respond to requests for comment yesterday.